Crystal Productions Take 5 Art Prints are a series of fine art prints printed on sturdy cardboard, laminated on both sides and ready to handle or display. Each themed set of five 18" × 24" (46 cm × 61 cm) reproductions comes in a plastic portfolio. On the back of each print is a statement about the artist and the art, and a guided analysis with questions and information providing background for classroom teachers to lead classroom discussions. A teacher reference guide is also included. Abstract Art — Set of 5 paintings by Davis, Demuth, Dove, Marisol, and Hartley. Printmaking — Set of 5 prints using differing techniques, including Intaglio by Cassatt, Serigraph by Johnson, Relief by Hokusai, Monotype by Thiebaud, and Lithograph by Toulouse-Lautrec. Interdisciplinary Connections: Art and Social Studies — Set of 5 regional paintings by Eddy, Lawrence, Wood, Garza, and Tooker. 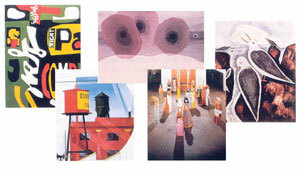 Cityscapes — Set of 5 works by Bearden, Bellows, Burchfield, Guardi, and Steffen. Landscapes — Set of 5 works by Bierstadt, Catlin, Constable, Hopper, and Kandinsky. Still Lifes — Set of 5 works by Magritte, Goings, Nelson, De Heem, and Picasso. Urban Environments — Set of 5 works by Ringgold, Bruegel, Rivera, Seurat, and Hopper. Self Portraits — Set of 5 works by Vigee Lebrun, Van Gogh, Wood, Lawrence, and Close. Pop Art — Set of 5 works Hanson, Lichtenstein, Oldenburg & Van Bruggen, Rosenquist, and Warhol.